Prominent & Leading Manufacturer from Jaipur, we offer suzani embroidery hand bag. Vishal handicraft is the leading of Suzani embroidery hand bag , made-up and begs. We are provided a high range and unique design of suzani begs. Suzani work these time is most popular product in market specially begs. 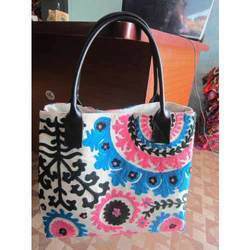 Because its design and colors in unique and handmade taste and vishal handicraft is a future design concept of handmade bags.